Streetdeck FCEV is the world first fuel cell double decker bus. Fuel cell system is made by Ballard, drivetrain is by Siemens. The manufacturer? The UK based company Wrightbus, which unveiled the vehicle at Euro Bus Expo 2018 in Birmingham, two years after having presented a concept. It has been tested in Aberdeen. The Wrightbus Streetdeck FCEV is 10.9 meter long and can carry up to 64 passengers (it shares the same chassis with the battery electric version). Battery pack, in the Streetdeck FCEV, is able to store 48 kWh: thanks to the fuel cell system (Ballard FCVelocity), they’re enough to cover, according to the manufacturer, 322 km (200 miles). A 426km extended range is also available. Refueling the bus takes approximately seven minutes. Heating and cooling systems are zero emission as well. Automatic BMS continuously monitors and balances the stored power while the vehicle is in use. The bus has been developed as part of the JIVE project funded by EU (Joint Initiative for Hydrogen Vehicles across Europe), and has already been ordered by the city of London, still in the framework of JIVE. Fuel cell buses are expected to importantly grow their market share in the years to come. ZeEUS eBus Report #2 released by UITP says fuel cell buses are expected to have a market share of 2 per cent in 2020 and 10 per cent in 2030, in the segment of urban buses and in European area. Still a little “slice” compared to the 52 per cent forecast of battery electric… but the multiplication for five is anyway impressing and opens up interesting scenarios for after 2030 years. 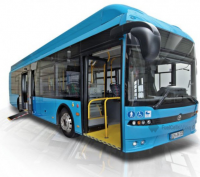 In 2019, European manufacturer Solaris Bus & Coach (recently taken over by Spanish group CAF) will unveil the Solaris Urbino 12 hydrogen, a new generation vehicle deriving power from a hydrogen fuel cell. Another competitor in the field of fuel cell buses is Toyota: its vehicle Sora has been approved and launched on the market (in the picture below). Ballard FCvelocity is also adopted by El Dorado National’s 40-foot (12 meters) Axess Fuel Cell Electric Bus, available in the US. The vehicle successfully completed testing at The Altoona Bus Research and Testing Center under a program established by the Federal Transit Administration (FTA).